Here is a baking fail - wanted to make an easy snack, and what could be easier than prepared dough and string cheese? 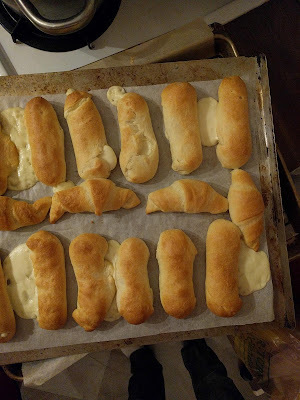 Two tubes of croissant dough and a bag of mozzarella string cheese later, I had a project. I originally planned on cutting it into pieces the length of the cheese and roll them up. But this dough would not comply. So I just cut the dough along the perforated lines and tried my best to cover up all the dough. Baked at the listed time on the tube for 20ish minutes. While that was baking I heated up the marinara poured myself a glass of wine. I made this for M, but I did have one. Should have brushed the tops with butter and garlic. And I think next time I'll make the dough from scratch.